I can also remember that we went to this show after getting back from a week long, hard-partying Port Aransas coast trip the same day, and I had a 103 fever as I stood on my chair in the Erwin Center that night. Made the whole thing somewhat surreal. we came from La. (12 of us all) to see the best show we had the greatest time!This was a copleat masterpeace!!!! correction to my prior posting, the opening song was "cinema" & appropriately so, following the opening act of bugs bunny. i've been a yesfan since mid 70s. i finally got to see them in concert @ this amazing show. i was stationed @ ft hood tx which is one hour north of austin. we got there early before the show started & there was the stage, i never seen anything like it before, looked like a big computer. i had heard the reason yes dropped berlin (the opening band) was because yes' stage was too complicated to have an opening band. after seeing the stage, i believe it too. i've been to many movies as a child that showed bugs bunny cartoons prior to the movie, but this was the only concert i've ever been to that bugs bunny opened. at the very end of the cartoon bugs went down a long winding sliding board that looked like it sent the rabbit sailing out into the audiance, & as bugs disapeared into the audiance there appeared yes on the stage playing the opening notes of "changes". awesome concert, i was completely sober & enjoyed every minute of it, & therefore can remember it, unlike other concerts i've attended. i like every album yes has done thru the years, with every line up, but my all time favorite is still "close to the edge". 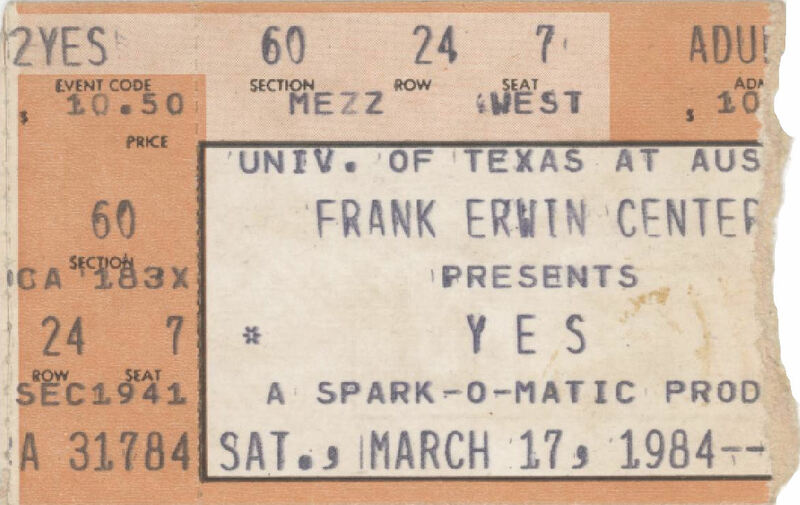 This was my first Yes show. I was already a fan since '76. I was stationed at Ft Hood, Tx. and my friends were black guys and I was forcing them to listen to Jon & Vangelis and Yesshows. So they knew who Jon Anderson was because of me. The reason i mention this is that I had to have a buddy go get my ticket for me b/c i had to be somewhere. Well, he did go and there were people waiting in line (yesfans). So, they asked him what he was there for and he started going on and on about Jon Anderson how great he is an all and naming songs and he says they were all amazed. We had a good laugh on that. Well, the show was pretty good. I was impressed with Trevor's playing of YIND. He did the little guitar thing that steve does and it sounded great and Trevor made a face like, that was sooo easy. Jon had a mike affixed to his chest so he was hands free the whole time. Otherwise, it was just like the 9012live video. Oh, Berlin was supposed to open for them on this tour, but Yes dropped them and there was talk of Berlin suing Yes. As it turned out, a bugs bunny cartoon was the opening act.